You will notice a theme over the next few days, and that theme is embodied by Malabrigo Worsted. In the final run-up to Christmas we’ll be focusing on yarns whose irresistible squishy softness will sooth your frazzled soul and knit up quickly; that will seduce any recipient no matter how much they try to roll their eyes and scoff at your precious handknits; and that come in so many colours you can find something for everyone. They are also a surprisingly good substitute for a whole range of patterns. Take shawls. Now, a beautiful, lacy shawl in some amazing sock yarn is a lovely gift, but entirely impractical at this point. However, switch the sock yarn for some Malabrigo Worsted and, hey presto, you’ve got yourself a shawl in about five days (probably less if you have the time to devote to it). This example is my old favourite, the Traveling Woman Shawl. I simply went up a needle size, followed the pattern and ended up with the joyful knitted equivalent of kittens snuggled around my neck. The only thing I would change if I made this again, is my bind off – it could do with being a little looser. 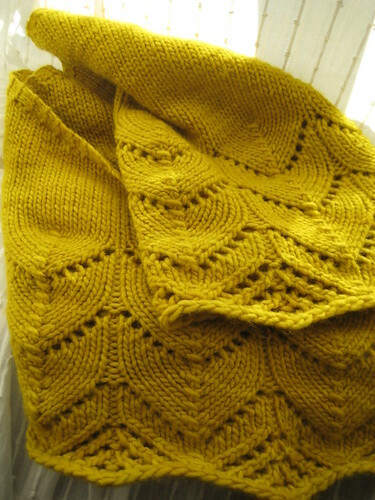 The bright yellow shade of Frank Ochre is also a favourite, although not something I would ever wear in a sweater, so it’s the perfect excuse to try out a bold colour. This is a yarn that is infamous for pilling and it’s true that the one sweater I have knitted with it looked years old in a matter of days and covered in pills (it has calmed down a lot since, after several shaves and bobble eradications) . However, this shawl has fared much better. It has felted a little, with the whole thing taking on the slightly fuzzy appearance of a much-loved teddy bear, but not a bobble in sight and the lace is still well defined. 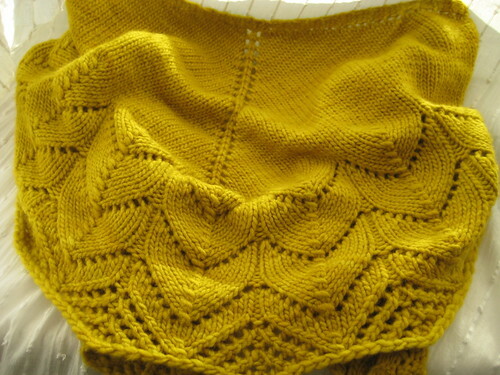 This entry was posted in Knitting and tagged Advent 2012, Christmas knitting, shawl. Bookmark the permalink. I want to snuggle in that shawl right now. Thank you for the reminder that laceweight designs can be scaled up! As the mother of a toddler, knitting delicate shawls in tiny yarns is unrealistic for the next few years, but I can still get my lace fix with worsted weight!